Computing professionals’ actions change the world. To act responsibly, they should reflect upon the wider impacts of their work, consistently supporting the public good. … The Code is designed to inspire and guide the ethical conduct of all computing professionals, including current and aspiring practitioners, instructors, students, influencers, and anyone who uses computing technology in an impactful way. The Code is applicable in our daily work lives, and I encourage you to read at least parts of the document – available in PDF at this link. We are also planning to share and review these principles with our student employees. ACM has also established a Committee of Professional Ethics (COPE). COPE is responsible for promoting ethical conduct among computing professionals by publicizing the Code of Ethics and by offering interpretations of the Code; planning and reviewing activities to educate membership in ethical decision making on issues of professional conduct; and reviewing and recommending updates to the Code of Ethics and its guidelines. 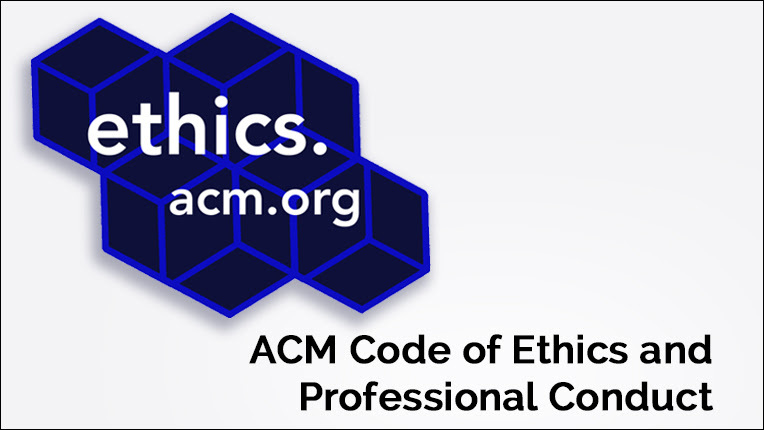 Join SIGCAS, the ACM SIG most directly involved with the code and with ethics in the profession. Submit feedback for the Code 2018 project, updating the ACM Code of Ethics and Professional Practice. Submit suggestions for the Integrity Project, or Ask an Ethicist. Attend one of our workshops on teaching computer ethics, commonly held at the SIGCSE and IEEE-ETHICS conferences. Or, if you have something else on your mind, Contact Us.